Beyond the Andes an unbelievable wealth of wines with great aromas and flavors are being prepared for the world. Their burgeoning popularity may create concern for Europe’s traditionally favored vintners. According to latest global wine market indicators and opinions of experts, Chilean and Australian wines are currently becoming the greatest surprise (and threat) to traditional wine-producing countries. Across the Andes there exist ideal conditions for growing enough first-rate grapes from which experts are able to prepare new-generation wines: fresh, strictly varietal, delicious, sparkly, filled with natural aromas and flavors. Over 100,000 hectares of vineyards are carefully nurtured, and on them are raised the finest clones of global varietals. Fashionable Chardonnay is of course included, but unfortunately most wine producers are adapting it to meet demand, aging it in California style – i.e., in new oak barrels. But Chile’s forte is red wines: Pinot Noir, Merlot, Cabernet Sauvignon, and Syrah mature there beautifully. 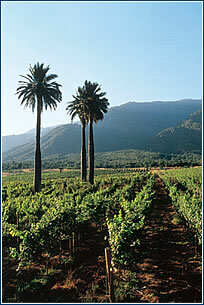 A specialty is the old varietal Carmenere, which originated in the Bordeaux region in France. In the aftermath of the catastrophe caused by phylloxera, this varietal was not replanted by European vintners, but it survived in Chile because the infection could not cross the ocean and the Andes. Although the vines in Chile have been growing since the middle of the sixteenth century, they were of poor quality, and only with the arrival of new technologies and trained experts in the 1980s did the character of local wines change, becoming delicacies much in demand. The vines are grown in river valleys in the vicinity of Santiago, where wine-producing areas are named after river valleys through which water from high Andean glaciers flows. The best known are the Acocagua and Casablanca Valleys, which lie to the north of the capital and enjoy warmer climates (valleys further south are cooler). While many Chilean wineries (Santa Helena, Viňa La Rosa, Valdivieso, Errazuuris, Concha y Toro) are already well known, the good prospects of Chilean wine making have attracted foreign investors as well, from Robert Mondavi of California to Baron Rothschild of France and Miguel Torres of Spain. 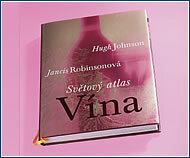 The world atlas of wine is probably the most complete publication of its type on the Czech market. It explains all the secrets of wine-making and drinking, and the back of the book contains a vocabulary of useful wine terms. Published by Fortuna Print. Price: CZK 1,490. Vinotheka Archa, Vachova 6, Brno střed. 5-12 March – Week of Rýnský ryzlink wines. 12 wines of this variety will be presented, and visitors will be charged according to number of samples tasted. 18 March at the same venue an evening will be devoted to combining spring dishes with wines. Tel: 542 215 136. From the rather scanty selection of Chilean wines on our market we selected four samples from three major producers that are worthy of uncorking. A dark, ruby-red wine whose aroma promises an extraordinary experience. Chocolate tones blend pleasantly with the aroma of ripe plums, and traces of vanilla denote its aging in oak barrels. The flavor is harmonious, with a long-lingering after-taste. Flashes of gold in a crystal-clear wine, fruity nose redolent of citrus, peaches, and bananas. Its flavor is harmonious, elegant, and pleasant, with lingering notes that make you want another taste. A product of Baron de Rothschild, the owner of a famed winery in Bordeaux, this wine is an excellent example of a varietal wine that stands out for its elegance, full body, lovely fruitiness and pleasing spiciness in both its aroma and flavor. A varietal that is nearly unknown here, its aroma and flavor are marked by the fruity tones of ripe grapes, with a pleasant, almost surprising spiciness of fresh-ground white pepper.